Anyone in the area covered by the Broadwindsor Group Parish Council is invited to an OPEN MEETING at COMRADES HALL, BROADWINDSOR. This is your chance to have your say on the future of your Parish by making your views known. The new pool table is very popular. Thank you to our Drimpton pool stars Kevin and Tom who gave members an enjoyable introduction to the game. Ten Pin Bowling Yeovil on FRI 11th FEB. The bus leaves the Village Hall at 6.15 pm and returns soon after 8.45pm. Please book your place with Mike by FRI 4th FEB and remember to bring the parent consent form. The outing is free, but bring money for refreshments if you wish. Any questions ring Mike. MARCH Youth Club Meeting will take place on SAT MORNING 12th MAR 10.30-12.30am to help all members who are participating in the Panto!. Normal games + Watch this space. Parents welcome to stay for coffee. There will be a stall or raffle for charity at each lunch. All villagers are invited to these meals of homemade soups served at the Village Hall in a friendly atmosphere. £3.50 per person. David Gordon, piano, Jonty Fisher, double bass, and Paul Cavaciuti, drums. producing a spicy musical feast! Beautiful, lyrical and humorous. "12 Months of Perennial Colour". Knowing him, it won't be all talk, so prepare for an interesting and practical evening, non-members welcome for a nominal fee. The Club is planning a trip to Prince Charles’ Highgrove gardens - the date has yet to be confirmed - but as soon as we have a coach-load it will be booked and there are about a dozen places still available, if you are interested, please contact Bob Harris for more information. Many thanks to Stan Sach for repairing the village notice board at Drimpton Cross. on SATURDAY 26th MARCH at 2.30pm and at 7.30pm. TICKETS: adults £3.50, children £2.00, under-5s are FREE. After lunch out at Lula's in Bridport, Kate and I, with the dog, went for a walk, of just over 6 miles, along the hills just north of Abbotsbury. We had wonderful views west to Golden Cap and east to Portland. In the nearer distance we could see Chesil Bank, and within it the Fleet. I wondered whether, in a couple of generations or so, if global warming leads to stormier weather in the British Isles, together with higher sea levels, whether Chesil Bank would still be there? Tonight, a new activity was born in Drimpton, digital time-capsuling, or as Andrew Pastor called it, filling empty virtual shelves. In this Census year, we will have the chance to record and preserve what counts to us. Imagine what it would feel like if you were digging in your garden tomorrow and found a time capsule. Taking it indoors, you find within, that people from 100 years ago have left notes, pictures, a simple record of what they did, how they lived their lives, even what was for breakfast. Suddenly your house reveals a history of what it was like to live, right there, three generations ago and you start to feel some real connection has been made with your predecessors. A score of village people turned out to the hall to hear Andrew describe how we can contribute and comment, to build the capsule. I used my mobile phone, an Android HTC Desire, to take a snap-shot. Funny how, just like school, nobody wanted to take the front row seats. 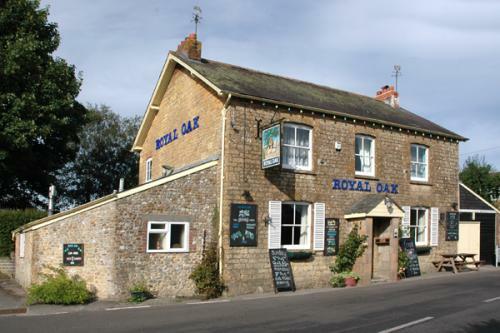 The Royal Oak was 'closed until further notice' after the Tuesday 18th January session. I contacted Palmers Brewery to find out what was happening and they gave me a short message to publish on this website. for a short period while everything is being put in place to reopen it. There are no plans to close it on a permanent basis." The Oak is an important landmark in this village, along with St Mary's and the village hall. The loss of our pub would be a sad event. Such losses are occuring regularly these days so we need to give it as much support as we can when it reopens. The first service of the New Year on the 2nd January saw St Mary’s welcoming the new Team Rector, David Baldwin, to our small church. The Rector made a good impression on the congregation and we look forward to his next visit. The banns for the March wedding of Mark Tilley and Kate Betts were also read for the first time. Mark is the grandson of Marion Hooper who lives in the village. Methodist Chapel at Netherhay at 10.00a.m. The group started in September 2008 and has averaged 6 to 8 parents with their children aged up to 3 years of age. There are a good selection of toys, books and activity equipment. The cost has just risen to £1.50 per session which includes drinks and biscuits for all. The Mums and occasional Dad enjoy a good chat!! The raspberries will be pruned and moved, they are currently lying east-west, they will change to north-south, to get better sun distribution on all plants. The new gooseberry, blackcurrant and strawberry plants will also line north-south. I have been forking out of the ground, old fruit bush roots and perennial weed roots. I have bags of compost to work into the soil, and some bags of well-rotted horse manure, which will also go on. That lot should ensure good drainage and enough material to prevent drying out in the summer, as well as plenty of nutrients - blackcurrants especially, as you cut them right back, take up a lot of food. We couldn't manage on the veggie patch so well, and that includes the fruit bushes, without being able to buy the horse manure from Steve and Sharon Chubb, who deliver a great load of bags to me every year. It is Saturday 8th January and the sun made its very first appearance for the year. Suddenly the chill damp gloomy greyness of the last few days after the bitter chill of the previous three weeks was lifted, and there was a new hope that Spring might not be too far away. A false hope? Maybe. But it didn't stop me going out into the garden to see if there were any signs of life after the severe weather. The sprouting shoots of crocuses have emerged but very little else is showing yet. But that's better than nothing. A bit more sun might also help to fight off the coughs and colds so many people are battling with; many are still laid low by flu or flu-type conditions. Why don't we just hibernate till April? Thanks to all the villagers who supported events over the Christmas period. At one time the organizers thought the severe weather might mean calling everything off, but we went ahead and villagers turned out in great numbers. A grand time was had. As a result funds were raised for charity. The Christmas Show raised £175 for CLIC-Sargent, and Carols Round the Village – which saw a choir of almost 30 sliding round the village! – raised £165.40 for charities helping the homeless. 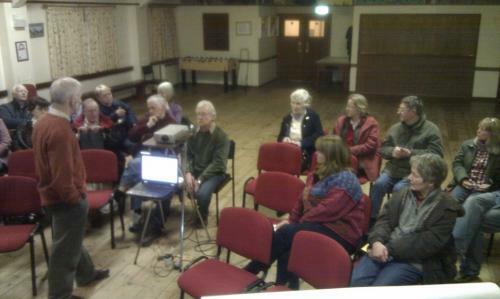 Next meeting FRI 7th JAN 6.30- 8.30pm. Introducing the new pool table (expert tuition provided) + Normal activity. NB new lower age limit 7 years old. Youth Club Christmas Card production in aid of NSPCC was a great success. Five designs were chosen: Emily, Aimee, Grace, Darcy & Flo (the boys boycotted the activity!!!). 555 cards were sold raising £222 to be donated to the NSPCC. Well done Libby and the girls, and special thanks to Carol, Jenny and Anna, our production and sales team, and to our community for their splendid support in buying the cards. Coming Event. Our first outing will take place in February….Ten Pin Bowling 11th or 12th February…Free but collect a consent form on 7th Jan.
All villagers are invited to a meal of homemade soups served at the Village Hall in a friendly atmosphere. £3.50 per person. You can leave your old Christmas tree in front of Manor Farmhouse (Point will be signposted) for collection and recycling by the council before 0730pm on 15th January 2011 or you can arrange your own collection on dorsetforyou.com. The trees left for central collection will be rewarded at a rate of £1 per tree. This money will be used to support our community. Call Mike if you need help in moving your tree to the collection point. Trees should be real and free of decoration. The Clapton, Wayford and District Hort. Soc. £2 buys entry and your first pudding. 50p for extra puds. The Library will visit OXHAYES on WED 12th & 26th JAN and on WED 9th and 23rd FEB from 12.05 to 12.35pm. Plants offers over 60 varieties of Seed Potatoes for sale, by the tuber or in bags, with information on type, cultivation and disease resistance for each one. All-day brunches and warming drinks will be served. Activities and fun for young people as usual. Please come along, if you are an experienced grower or just starting out on veggies, you will find this a friendly and useful event. The following Trust Fund Donations have been awarded to community organisations through 2010 from funds raised within the community. Netherhay Parent and Toddler Group £75- Drimpton Football Club £300. All these village-based organisations are very grateful for this support. Planning for Fun Day 2011 has started and needs volunteers to help make it happen. If you would like to get involved, please contact Mike. After 12 years of organising the Artsreach Productions in aid of the Village Hall, the time has come for Viv, Christabel & Jane to step down. They have one more production on March 4th entitled "David Gordon Trio speaks Latin", and would appreciate seeing as many of you as possible at that time. If there is anyone who would like to become the promoter, Viv, Christabel and Jane would be very willing to share their knowledge and help in any way in order that these valuable events are not lost to the community. If you are interested, please telephone Jane; we would all be happy to help you. Our thanks go to everyone who has helped, supported and enjoyed the productions we have brought to our hall over the years.